Peanuts, Cracker Jack, cotton candy, and hot dogs! Those are my fondest memories of the ball park, and they certainly top my daughters' lists as well. But one equally hallowed tradition of baseball had been fading from the American scene, so I'm glad to see a picture book that's bringing it back. Betsy's Day at the Game, written by Greg Bancroft and illustrated by Katherine Blackmore, describes a young girl's visit to the ballpark with her grandfather. The book captures all there is to love about baseball, and that's because author Greg Bancroft seems to be a baseball fan first and foremost. His descriptions and Katherine Blackmore's images capture the sights, sounds, smells, and (my favorite part) tastes of the ballpark. Via their narrative, we spend a day vicariously at the park. Simple enough, right? As the story progresses and the game begins, however, we realize that much more is taking place. Betsy and Grandpa are teaching us, step by step and in plain English, how to keep score. For the those who are as clueless as me, keeping score in baseball goes way beyond tallying runs! Codes and symbols are entered onto a scorecard, effectively chronicling every offensive and defensive play of the game. From what friends have told me, baseball fans can read a score book and see the entire game played out in their heads in the same way that musicians can read musical notation and actually "hear the song." So while I started out as a true scoring novice, by book's end I had a pretty good idea of the whole process. And trust me, if I can figure it out, anyone can! 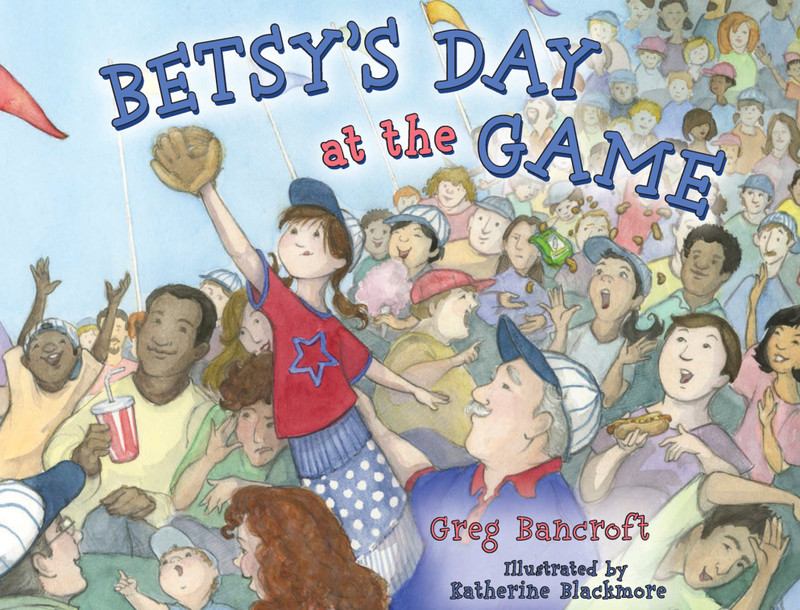 Betsy's Day at the Game would definitely score a home run with any young baseball fan. Using the handy scorecards supplied in the back of the book, fans could easily follow along with and score their favorite team at the park or on TV. Aspiring writers will want to check out Greg Bancroft's 10 Things I Didn't Know Until I Published My First Book. If you're planning on breaking into the book biz, you should read this article! See more of Katherine Blackmore's illustrations at her site. Check out a tutorial on scoring if you want more examples, plus the formulas to figure out all the stats you would ever need. The actual scorecard isn't as nice as the one in the back of Betsy's Day at the Game, however. The Baseball for Kids site features lots of extras for young fans of baseball. Taking your child to the park for the first time? Definitely make a Plan B! As parents, we know how attention spans can wane as kids become hot, tired, cranky, over-sugared, and restless. 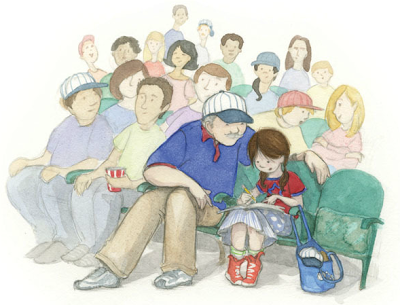 TeachMama has a fabulous set of suggestions for surviving your outing using Kid-Friendly Learning During Baseball Games. 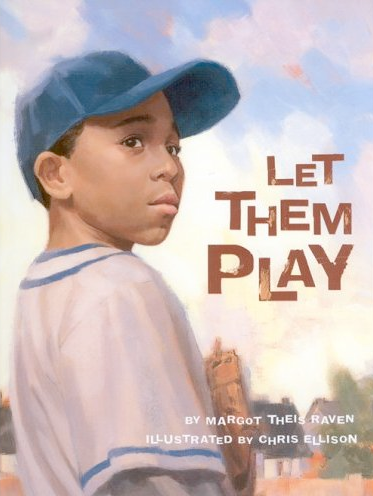 Check out some earlier posts on the Teach with Picture Books site including Going Extra Innings with Baseball Picture Books (books and lots of sites for kids about baseball), A League of Their Own: Women in Baseball, and Girls Got Game (incredible female athletes). Let Them Play, discussed in an earlier post on Black History, is another baseball story from history that kids find incredibly intriguing. With 42, the Jackie Robinson movie, releasing in theaters this weekend, younger readers might be interested in learning more about this courageous hero of baseball history. For readers in grades 2-5, I highly recommend Jackie Robinson: American Hero, written by the star's own daughter, Sharon Robinson. This transitional book features not only the perfect blend of images and text, but also the perfect blend of backstory and biography. 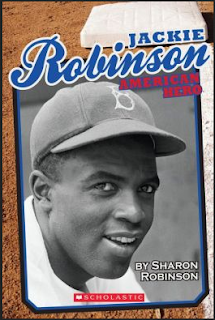 Sharon Robinson provides young readers with just enough historical context to understand and appreciate what made Jackie Robinson's accomplishments incredible not only for his time, but for all of time, and not only in sports history, but in our nation's history. If you're a teacher hoping to engage your reluctant readers with chapter books, this one is a winner! I love teaching with picture books in my fifth grade classroom! Love your blog!